If you have been using the SQL Azure Portal for creating SQL Databases and connecting to them from your SQL Server Management Studio, you would have realized the ability to query the Azure Cloud Databases from within the management studio. While this provides great opportunities in terms of relation capabilities and accessibility over the Cloud, there has been a recent upgrade to SQL Azure and in that process there has been a Firewall Support added to the SQL Azure Portal access. Cannot open server <servername> requested by the login. 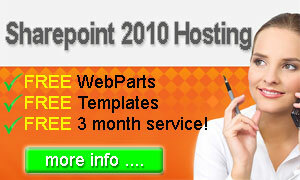 Client with IP Address “<your IP Address>” is not allowed to access the host server. As the error message indicates, the SQL Azure Portal has declined access to the portal for your IP Address. This specific filtering helps companies protect their data hosted in the cloud from access by just any host. This allows companies to restrict the access to a specific set of hosts such that they do know that those are safe. As a result, your existing applications / querying from SQL Server Management Studio might just fail. Note that by default no IP’s are allowed to access your server. Also, there has been a change in the way the server is accessed as well as the credentials specified. Lets see them step by step. 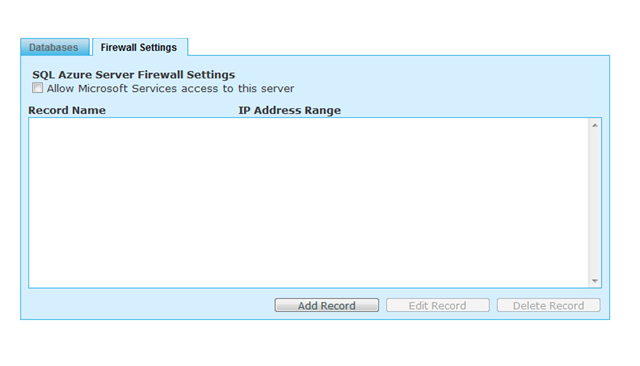 Click on the “Edit Record” to open up “Custom Firewall Settings” window that lists your IP address as well. You can also specify a range in case you want to. Once you have typed the IP Address, click “Submit” (Note that if you dont have an IP Address range, you would have to type your actual IP Address in the bottom textbox after the “to” which means the top one is 0.0.0.0 to <IP Address you specified>. 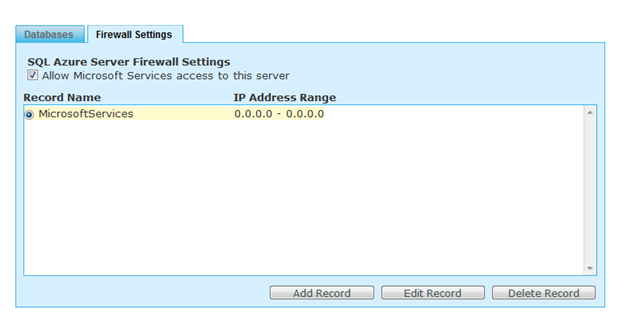 You can add more IP Addresses by clicking on “Add Record” button and repeating the above steps. Once you do this, you would be able to access the SQL Azure database from SQL Server Management Studio.